From West Hartlepool, served with 18th Battalion DLI (Durham Pals). 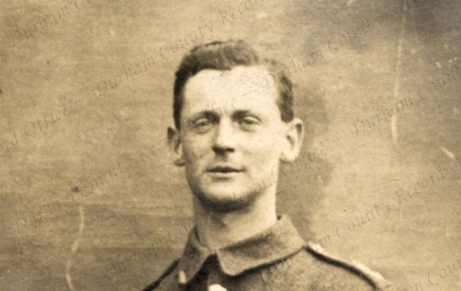 Samuel Robert Wyld was born in West Hartlepool and enlisted as a private with the 18th (Pals) Battalion, Durham Light Infantry, in September 1914. He trained at Cocken Hall and in other camps around England before sailing for Egypt with the battalion in 1915. In March 1916, the battalion left Africa for the Western Front. Through 1916 and 1917, Wyld is promoted and in May 1917, he is commissioned from the ranks and sent back to the UK for training. On returning to France in 1918, he is posted to 22nd Battalion, Durham Light Infantry, and later moved again to the 7th Battalion. Wyld kept a diary (D/DLI 7/797/1) of his time in the army and notes on November 1914 buying an engagement ring. In February 1919, a month before he is discharged, he marries Rhoda Grey while on leave. In 1942, during the Second World war, Wyld joined the Home Guard on Teesside.